I almost checked “Suspense” on this one, as it has some characteristics of one; we’re let on very early that “Travis” is not, in fact, Travis, but his estranged twin brother Trent. He’s a former private investigator, and he’s curious to know what really happened–so he steps into his brother’s boots. The mystery of what really happened to Travis is what drives this story along, coupled with he and Elena’s growing attraction. At first, she’s baffled by what a different, caring man “Travis” is–he even helps with the dishes! Once she finds out, of course, she’s a bit bent out of shape about being lied to, but by then, Trent has a hunch what has happened, and enlists Elena’s aid in finding out. I really enjoyed this tale, a lot more than I expected. Trent’s pretense is immediately made clear to us by the author, yet Elena is kept in the dark until nearly half-way through. I’m not fond of this sort of subterfuge, generally, but Elena’s confusion at “Travis’s” behavior, and Trent’s misgivings about the necessity of the lie while he gets to the bottom of things, are both very well executed. He feels the end justifies the means, and is instantly apologetic about it when things come out, and Elena shortly accepts it, and begins to aid him. Unsurprisingly for this line, our protagonists have ample opportunity to get intimate throughout the book, but Trent, true to the mental conversations we see, holds back for quite some time, and will not let Elena into his bed. Once they finally do, the loving is much more honest and positive than it would have been earlier in the book. I feel that this holding back that Trent did really gelled him as a “good guy” in my mind–the one thing he’s doing wrong is impersonating his brother, and he makes that right. Our supporting cast is pretty low-key, but Elena’s brother, in particular, gets quite involved, and his fierce protectiveness of his sister helps drive things along, and put some of the mystery bits together for us. The twists and turns of plot in this story all revolve around what actually happened to Travis–we are unsurprised to find that he did not, in fact, die on that mountain. Justice prevails, and our hero and heroine are able to be honest about their love for each other, and the child they will raise together. 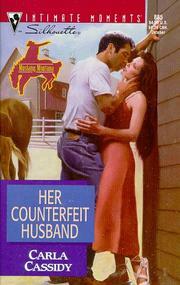 In Her Counterfeit Husband, Cassidy weaves a somewhat-complex mystery tale around a simple, straightforward love story. There are few great moral challenges here; it’s just a fun, interesting, well-done tale. I enjoyed it, and hope you will too.